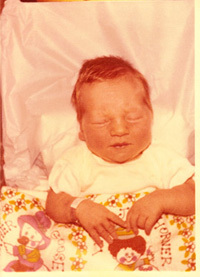 Thirty-six years ago today a shrunken, bloody-faced demon with slimy black hair nearly scared me into an early grave. I still carry the physical and emotional scars. Something overpowered me in my sleep. I could barely walk and was incoherent by the time they wheeled me to a cold place with walls that moaned every 15 minutes. The next morning, men in green with empty eye sockets probed my body until I was paralyzed from the waist down. There was a blinding white light. The end was near. Suddenly, like a scene out of a horror film, an ugly little gremlin plopped on my chest and let out a spine-tingling scream. 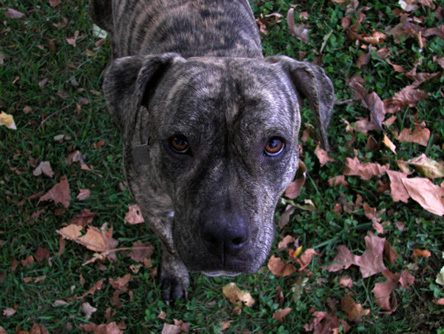 In shock and awe, I starred into an impish face only a mother could love. A few hours later, my precious Gollum looked more like cute little Dobby. The gore and birthmarks on each cheek of his elongated head had disappeared. He cleaned up real nice for his hospital photo. Such an unnerving chapter in my life story. I was young and naive and didn’t take birthing classes. I felt so quilty for letting someone nearly twist his head off with a pair of cold, surgical steel forceps. I was scarred for life, but he grew up with a healthy addiction for Halloween masquerades and a good thriller movie. Every season my little hobgoblin decorates his house and yard like a Clark Griswold Christmas and wears the ugliest face he can find to scare unsuspecting souls into an early grave. Camping season at our Thousand Trails Nature Preserve comes to an end this month. 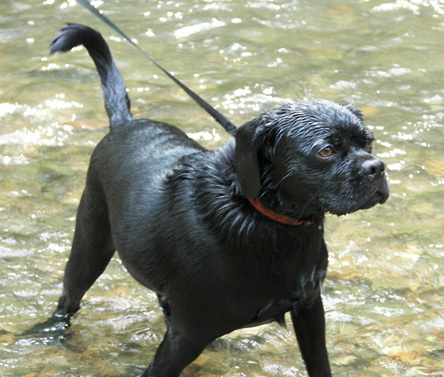 We won’t visit Horseshoe Lakes in Vermillion County, Indiana, again until April. “King of the Cowboys” Roy Rogers and his wife, “Queen of the West” Dale Evans, sang Happy Trails to sign off their television show in the 1950’s. They owned Happy Trails Resorts in conjunction with the Thousand Trails Organization. A large corporation now maintains over 80 Thousand Trails/NACO preserves throughout the United States. Our 290-acre home preserve is named for its large horseshoe-shaped lake, surrounded by 10 smaller spring-fed lakes. We take our golf cart on “bunny” trails through the wooded landscape to get to the best spots for fishing and taking photos of the flora and fauna. My best friend and I tried tent camping in August 2003 during the Sturgis Motorcycle Rally in South Dakota before trading up to a toy hauler RV in Spring 2004. 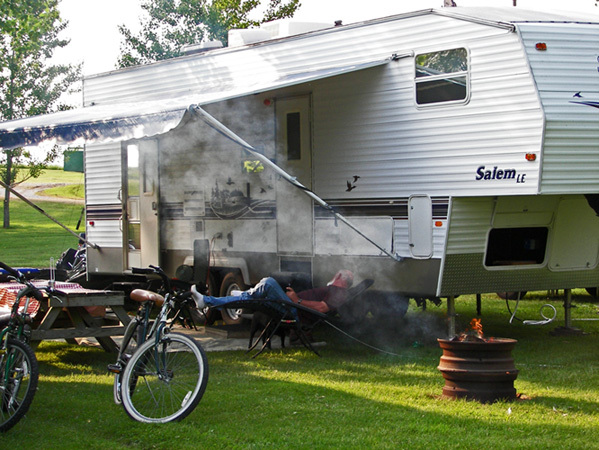 We have been happier campers since, and now own a 32-foot Salem toy hauler so we can take along our Harley-Davidson or golf cart and still comfortably sleep 4 to 6 kids, plus our personal body guards Pooch and Lola. We try to go camping every Memorial Day and Labor Day weekend at different campgrounds within a 1 to 3 hour drive. For summer vacations, it’s cheaper to leave the fifth wheel at home and reserve a getaway cabin in another preserve several states away. 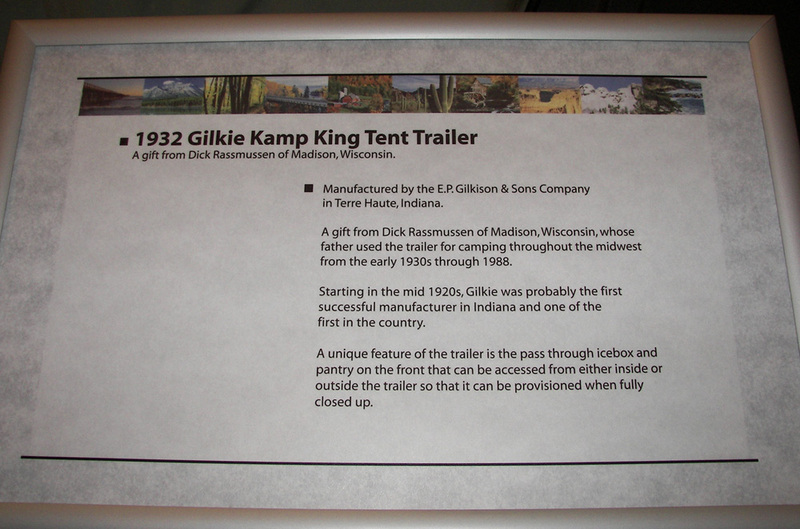 In 2009 we found a campground near the RV/MH Hall of Fame in Elkhart, Ind. 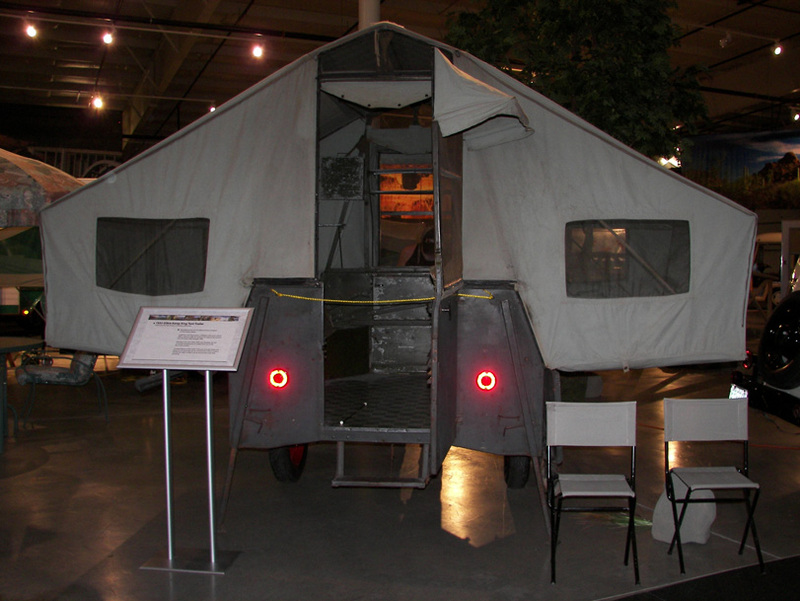 Those who embrace the RV lifestyle will appreciate the museum. There we found a Terre Haute connection to the RV industry’s humble beginnings.